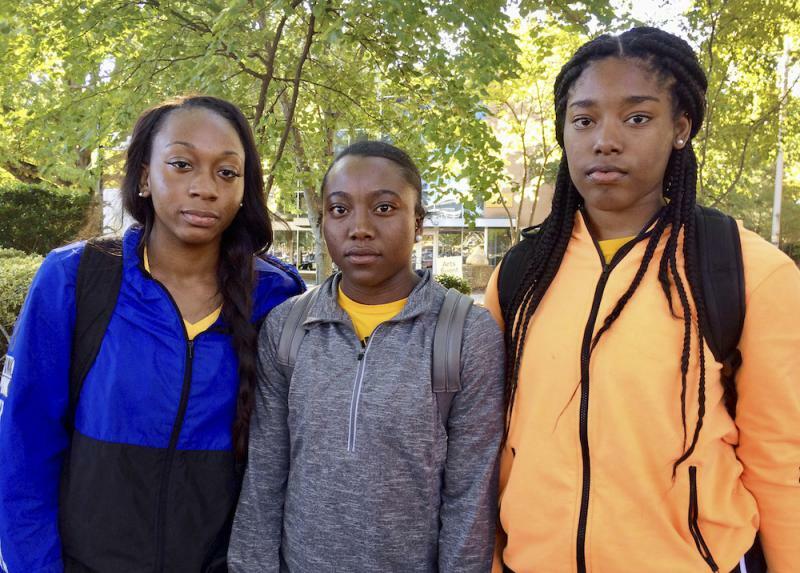 KSU cheerleaders, from left to right, Shlondra Young, Tommia Dean and Kennedy Town are part of a group of cheerleaders that say they'll take a knee in the stadium tunnel when the national anthem is played at Saturday's homecoming game. As protests over racial injustice grab national attention in pro sports, some college and university officials are having pre-emptive talks with student-athletes and consulting each other amid concerns that such actions will spread to college sports, according to emails released Thursday. After five black cheerleaders at Kennesaw State University knelt during the national anthem at a September football game, athletic officials there sought advice from their counterparts at schools including the University of Georgia, Georgia Tech, Duke University and Purdue University. The responses they got back offer a glimpse at what's happening in college athletic programs trying to strike a balance between supporting free expression and offending fans and donors. The emails were released Thursday in response to a request for Kennesaw State documents under Georgia's open records law. It was filed by Davante Lewis, the brother of the one of the cheerleaders who took a knee. The kneeling demonstrations have been inspired by former 49ers quarterback Colin Kaepernick's refusal to stand for the national anthem last season to protest police mistreatment of minorities. At the University of Georgia, home of the nation's No. 3-ranked football team, a top athletic official says they advise head coaches to respect students but be prepared. "Respect the decision of student-athletes to exercise their rights and be careful not to say or do anything that could be misinterpreted as discouraging student-athletes from engaging in expressive activity," wrote Claude Felton, senior associate athletic director at the University of Georgia. Also, "know in advance of any planned expression of beliefs by our student-athletes (e.g., kneeling, raised fist)," he wrote. At Georgia State, football coach Shawn Elliott has spoken with his team about understanding what they're protesting. "Several of our football players walked in the Black Lives Matter protests a few years ago and we encouraged them to do it, but to also understand why they were there ...," Mike Holmes, associate athletic director for sports communications, wrote to his colleague in Kennesaw State's athletic department. At Georgia Tech, discussions between coaches and athletes have focused on unity after a campus police officer's fatal shooting of a student, Mike Flynn, an assistant athletic director, wrote to his Kennesaw State colleague Michael DeGeorge. Flynn shared what Georgia Tech Director of Athletics Todd Stansbury wrote to student-athletes following the shooting and an ensuing clash between demonstrators and police in which a campus police car was burned. "Quite simply, athletics unites a college campus unlike anything else," he wrote. "As some of the most visible members of the Georgia Tech community, we all have an opportunity and a responsibility to use our platform to lead the efforts to unite this campus," he added. "I urge each of us to take a positive, active role in doing so." At Duke, a senior associate athletic director told DeGeorge officials try to "Allow the student-athletes to understand what it is that pro athletes are doing, and why they're doing (it)." "It is not to disrespect the country, or the President," DeGeorge wrote in his report, under the Duke section. "Make sure student-athletes understand the other side — how kneeling (or not standing) is perceived by military or veterans, and what their reaction would be to your action." The Kennesaw State cheerleaders — known around campus as the Kennesaw Five — were told they'd be kept off the field in a stadium tunnel at future pregame activities after five of them knelt at a Sept. 30 game to protest racial injustice. University officials have said moving the cheerleaders before kickoff was intended to "enhance the game-day atmosphere." The state university system's Board of Regents is reviewing the school's handling of the situation. Now, the five cheerleaders who protested are vowing to kneel in the stadium tunnel Saturday — even though they'll be outside of public view — before the school's homecoming game. 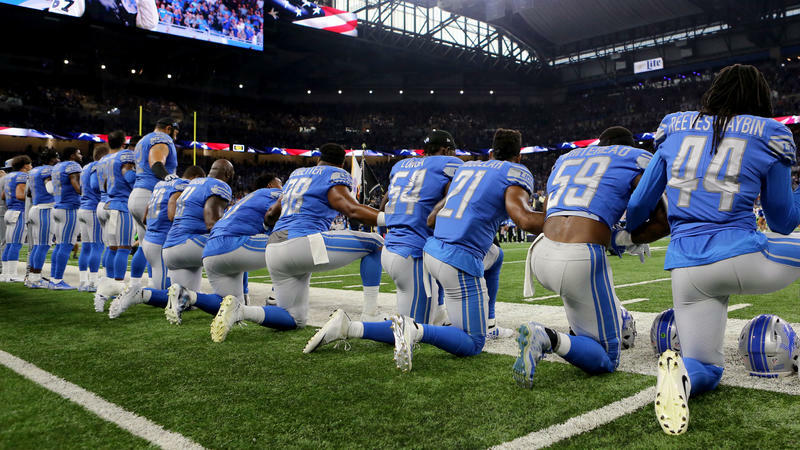 The NFL has been embroiled in controversy over players using the anthem to protest racial inequality. Although there have been some college-level protests, college teams are not typically on the field during the anthem. Kennesaw State doesn't have the name recognition of Georgia Tech, Duke and other schools it reached out to, but it's in league with them in terms of size. With 35,000 students, Kennesaw State is Georgia's third-largest university and one of the nation's 50 largest public institutions. On today's Political Rewind, the national debate over athletes and the national anthem lands on the football field at Kennesaw State University. Does newly released evidence show that political pressure shut down protesting cheerleaders? Also, a high level Stacey Abrams campaign official appears on Russian media that is part of the FBI's investigation of organizations that tried to influence last year's presidential election. We also discuss the feud between the president and the family of a fallen U.S. serviceman. The student who wears the owl mascot costume at a Georgia public university where five cheerleaders knelt during the national anthem had no business leading a cross-campus march in support of the cheerleaders, an influential lawmaker said. Kenneth Sturkey, who dresses as Scrappy the Owl at Kennesaw State University athletic events, said he donned the costume without permission for Monday's rally on behalf of cheerleaders who knelt at a game Sept. 30 to protest racial inequality.